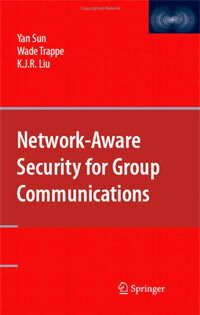 Professor K. J. Ray Liu (ECE/ISR) has co-authored a new book titled Network-Aware Security for Group Communications. The book serves as a reference on how to secure group communications in emerging networks and for future applications. Liu's co-authors are two of his former students, Dr. Yan Sun (Ph.D., 2004), assistant professor of electrical and computer engineering (ECE) at University of Rhode Island, and Dr. Wade Trappe (Ph.D., 2002), associate professor of ECE at Rutgers University. The book fills a growing need in the research community for a reference on group communications security. The growth of multi-user services makes it essential that a complementary suite of security solutions are deployed in order to protect these services from a broad spectrum of security threats that are unique to group communications. This book is focused on tailoring security solutions to the underlying network architecture (such as the wireless cellular network, or ad hoc and sensor networks), or to targeted applications using methods tailored for that application (such as multimedia multicasts). The authors focus the discussion on two fundamental security issues for group communications: providing efficient key management for providing confidentiality, and providing authentication for group services. The book is geared primarily toward industry researchers, graduate students, and professors. For more information about the book, visit the Springer Science and Business Media website.